The universe is a massive, mysterious place; our solar system, and specifically the human race, plays only a minor role in the greater span of the universe. The observable universe, 45.7 billion light-years large, is only what humans have been able to discover. But the entire universe is thought to be more than 250 times larger than that. Much of what we do know about the observable universe has been documented by telescopes, such as the Hubble Space telescope, since the universe is too vast for human exploration. Our solar system is one of many solar systems within our galaxy, and our galaxy is only one of many galaxies within our universe. Stacker researchers investigated different structures in the universe and ranked them in order from largest (universe) to smallest (subatomic) and everything in between. These rankings include structures found in outer space, such as nebulae, galaxies, and planets, as well as such things as Mount Everest, human beings, and elements on our home planet Earth. While researching structures or particles that are much smaller than we may have ever thought possible, such as quantum foam, performing research on the depths of space has proven to be much more challenging. Through our understanding of the world around us on Earth, we can use science to deepen our understanding of events that happen on even subatomic levels. The same cannot be said for certain parts of outer space and our universe. Scientists are always learning new things about what's “out there,” and no sort of guidebook exists for what to expect. Read on to learn about the scale of the universe. The size of the universe has been a major topic of discussion for years. For many decades, scientists believed the universe was 13.75 billion light-years (one light-year equals about 93 million miles), determined by multiplying the speed of light (186,282 miles per second) by the time that has elapsed since the Big Bang (13.75 billion years). However, after making adjustments for when the light was produced, universe expansion, and acceleration, a group of astrophysicists in 2005 led by J. Richard Gott of Princeton University calculated the radius of the observable universe to be 45.7 billion light-years. Deep field observations are long-lasting observations that reveal faint objects by gathering light. The deeper the observation, meaning the longer the exposure time, the fainter the objects that are coming to light. The 2004 Hubble Ultra Deep Field shows the deepest visible light image of the observable universe ever to be achieved by humankind. The Sloan Great Wall is a group of galaxies located in the Sloan Digital Sky and is considered the largest known structure. Several large superclusters of galaxies can be seen in this structure, such as the Shapley Supercluster (part of the Pisces-Cetus Supercluster). Eridanus Supervoid: Possible parallel universe? The Eridanus Supervoid is a cosmic microwave background (CMB) cold spot in the universe. Although CMB cold spots are somewhat common in space, the Eridanus Supervoid cold spot is so large and so cold that it cannot be explained by the same measures as the other cold spots. Some researchers argue that it is actually a supervoid into a parallel universe. The Virgo Supercluster is home to over 100 galactic clusters, the largest being the Virgo Cluster. This cluster is located within the Pisces-Cetus Supercluster Complex. What we know as the Milky Way galaxy is on the outskirts of the Virgo Supercluster. The Andromeda Galaxy is considered the Milky Way's twin, as they are relatively the same size and similar in shape. It is predicted that these two galaxies will collide in a few billion years to form an elliptical galaxy, Milkomeda. The Milky Way Galaxy is where we live. It is a large barred spiral galaxy and looks like a milky band of light in the sky when seen in a dark area. There are an estimated 100 billion stars in this galaxy. However, scientists' estimations are based on what they can see from within the galaxy, which has made research somewhat difficult. The Sagittarius Dwarf Galaxy is one of the Milky Way's satellite galaxies, as it is only 70,000 light-years away. It is also the closest galaxy to our own and is one of many galaxies in the area, as well as two magellanic clouds (irregular dwarf galaxies). This galaxy was discovered in 1994 and astronomers currently believe it is being slowly pulled apart by gravity. The Tarantula Nebula is the largest known nebula in our universe. It is extremely violent, with intense radiation, winds, and supernova shocks coming from the center of this massive star. It is also one of the brightest non-stellar objects known in this universe. The Omega Centauri is the brightest globular cluster in our galaxy and contains over 10 million stars. Scientists believe this cluster may be the remnant core of a smaller galaxy that collided and merged with the Milky Way. The Lagoon Nebula was discovered in 1747 and contains many Bok globules, which are dark collapsing clouds of protostellar material, and many volatile stars. The giant star in the center of the nebula is called Herschel 36 and it blasts out ultraviolet radiation, tornadoes, and hurricane-like stellar winds. This nebula is one of the most visible from Earth, and is its closest large star-forming region. It lies in the Orion constellation, hence its name. The Orion Nebula is an enormous cloud of dust and gas and many new stars are being formed within it. The Pillars of Creation reside within the center of the Eagle Nebula and are made of cosmic dust and gas. They are part of an active star-forming region within the Eagle Nebula and contain many newborn stars within their pillars. The Oort Cloud can be found in the outermost region of our solar system at the edge of the Kuiper Belt. It is believed that the Oort Cloud is a giant spherical shell surrounding the sun, our planets, and the Kuiper Belt. The icy bodies within the cloud are extremely large, bigger in some cases than Earth's mountains. Gomez's Hamburger is a sun-like star that is emitting large amounts of dust and gas as it nears the end of its life. It will soon become a planetary nebula once the star officially dies, and is 2.5 trillion kilometers large. The hamburger “buns” are light reflected off dust, and the “patty” is the dark strip of dust in the middle. The Kuiper Belt is an area of leftovers from our solar system's early history. It is a doughnut-shaped ring that contains icy comets and other icy objects. Although in the universe the Kuiper Belt is not a major structure, it is considered one of the largest structures in our solar system. Although our sun appears to be very large in the context of our solar system, it is actually only an average-sized star. This star emits large amounts of heat and light, as well as solar winds, which are low-density streams of charged particles. These solar winds, as well as solar flares, are responsible for many occurrences on Earth, such as the aurora borealis. Jupiter is the largest planet in our solar system and is more than twice as massive as all the other planets combined. It is a gas giant and has over 75 moons. The iconic Giant Red Spot is a massive storm that is roughly double the size of Earth and has been active for over a century. Earth is relatively small compared with other planets and structures found in our solar system and the universe. It only has one moon, which is uncommon for our solar system. It is believed that our planet formed 4.6 billion years ago from a solar nebula explosion resulting in clumps of matter that collided and merged together. The Great Wall of China, located in Northern China, is the longest wall in the world at more than 13,000 miles, and has a 2,300-plus-year history built by different states or dynasties. It was originally intended to be three times the height of a man, though it is not clear if that feat was ever completely accomplished, and parts of it have eroded over time. It was built to stymie invaders and to protect Silk Road trade. The Grand Canyon is a massive national park in Arizona. Not only is it vast in size, containing over 1 million acres, but the Colorado River, which carved the canyon, courses across the canyon bottom. Width and depth of the canyon vary, depending on the location. Halley's Comet was predicted by Edmond Halley in 1705 after he surveyed the orbits of 24 comets and realized that comets that appeared in 1531, 1607, and 1682 had similar orbits. He determined it was actually one comet that had an orbital period of approximately 76 years. The discovery was also notable because it proved that there are other celestial objects in our solar system that are centered around the Sun. Mount Everest in southern Asia is part of the Great Himalayas, and is the highest mountain in the world. Over 4,000 people have climbed it, though almost 300 have died in their attempts to conquer the mountain. Central Park is the largest public park in New York City; construction began in 1858 after many years of planning and project proposals. It officially opened in 1876 and is considered to this day one of highest achievements in artificial landscaping. The Burj Khalifa, located in Dubai, UAE, is the tallest building, the tallest structure, and the tallest free-standing structure in the world. At more than 160 stories, the Burj Khalifa has the most stories in the world, as well as the elevator with the farthest travel distance in the world. The RMS Titanic was built in the early 1900s and was one of the biggest ships for its time. It could hold over 3,500 people and could reach 24 knots (27.6 mph) at full speed. However, it had only been at sea for five days during its maiden voyage when it hit an iceberg and sank in the ocean, killing roughly 1,500 of the 2,200 people on board. The Tyrannosaurus Rex was one of the largest meat-eating dinosaurs to ever live. Roughly 12 meters long, seven meters tall and with a 1.5 meters-long skull, this dinosaur was a fierce predator. It became extinct as part of the Cretaceous-Tertiary mass extinction 65 million years ago. Human beings play a large role on Earth, but as far as we know, this is the only planet in our solar system that supports living beings. Compared with other mammals that have lived on the planet, humans are fairly average sized. In 1952, British Nobel laureate Bertrand Russell suggested that there was a teapot revolving around the sun in an elliptical orbit. The teapot, however, was too small to be seen with a telescope, therefore no one could prove or disprove whether this teapot was actually there. This teapot analogy was used in discussions concerning the existence of God. These tiny insects make up a decent proportion of the land animal/insect population, as there are billions, if not trillions, of ants on the planet. Ants live in structured colonies, run by the queen ant and operated by female worker ants with the main goal of protecting the colony and continuously reproducing. An ovum, or a human egg, is the largest cell in the human body. Because of its size, a human egg can be seen with the naked eye, without the aid of a microscope. Skin cells, also known as keratinocytes, develop from the bottom, or basal layer, and travel upward during a four-week period until they reach the outermost surface where they shed. By the time they reach the outermost surface, these cells are dead and are at their strongest protection. Mist droplets can somewhat reduce visibility, as well as reflect and scatter light so rays of light shine through them. Rainbows are formed when there are mist droplets in the air after a rainstorm and the sun shines through them. Silk is considered a luxury in many parts of the world and is used in clothing and other fabrics and textiles. It is produced by silkworm larvae, and certain types of silkworms, such as the mulberry silkworm, are more valuable than others. White blood cells, although only making up about 1% of our blood, are key to good health and protection against diseases. These cells flow through the bloodstream and fight off viruses, bacteria, and foreign bodies that can threaten our health. Red blood cells carry fresh oxygen, circulating throughout the body once every 20 seconds. They are small and circular, with a dent in the middle to allow for more surface area and easier transportation of life-giving oxygen. Mitochondria are known as the powerhouses of the cell, as they fuel our metabolism by turning oxygen and nutrients into energy. Mitochondria are essential to survival, and there are trillions of mitochondria in our bodies. The X chromosome is the basic structure for most chromosomes. Females have two X chromosomes, while males have one X chromosome and one Y chromosome. It was first discovered in 1890 by Hermann Henking in Leipzig, Germany. Red light wavelength is the first color in the visible color spectrum and has the longest wavelength of all the colors. The wavelength indicates that the energy of the light, or its photons, is very low. The megavirus was discovered in 2010 by a group of scientists involved in the research of the mimivirus, which was the largest virus until the megavirus was found. Although the megavirus is slightly smaller in size than the mimivirus, its DNA genome—complete set of DNA—is much larger, containing 1,259,197 base pairs. This is the smallest size an optical microscope can see. This microscope is commonly found in high school or college labs. HIV is a virus that attacks the body's immune system and causes AIDS. Less than 1% of the human population has HIV. Although this virus is extremely small, it is extremely powerful and often fatal. There is currently no cure for AIDS. Deoxyribonucleic acid (DNA) stores genetic information in humans, as well as almost every other living thing on Earth. DNA strands contain about 25,000 genes and a single human cell contains roughly three meters of DNA. Most DNA among humans looks exactly the same, even though on the outside we may look different. Glucose is a simple sugar that humans use for energy. Plants produce glucose through photosynthesis and turn it into complex sugars. When humans eat plants or animals that have eaten plants, we break down these complex sugars into glucose. The alpha helix is one of the secondary structures of proteins and many proteins contain alpha helices. Two proteins, hemoglobin and myoglobin, are made up of about 70% alpha helices. Water is composed of two hydrogen elements bonded to one oxygen element. It is the only natural substance found in all three forms (solid, liquid, gas) on Earth. As a universal solvent, it dissolves more substances than any other liquid. 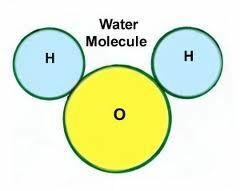 The physical water molecule resembles Mickey Mouse. Hydrogen consists of one proton and one election and is the most abundant element in the universe, making up about 75% of the mass of the universe. It is the simplest and lightest element found on the periodic table. Gamma rays have an extremely high frequency and can come from radioactive decay or other nuclear reactions. They are the most energetic wavelengths on the electromagnetic spectrum. Gamma rays can be produced from processes that occur in black holes and pulsars. The size of a proton has long been debated by scientists. Disputes over how to accurately measure protons prevented an agreed-upon calculation. However, in 2010 a new kind of experiment was performed by the Paul Scherrer Institute in Villigen, Switzerland, using a lab-made ‘muonic' hydrogen atom that allowed scientists to more accurately estimate the proton's radius. The study of quantum foam falls under quantum mechanics, a branch of physics that examines how light and matter operate at atomic scales. Quantum gravity models claim that space-time is composed of tiny foaming regions that blink in and out of existence, similar to bubbles in a can of soda. Since there is no such thing as empty space, these “bubbles” coming in and out of existence are known as quantum foam.